When researching existing products, it is important to focus on those that may contribute in some way, to a new or improved design. Existing or similar products, may have functions and features you find of interest or partly solve the design problem you are working on. 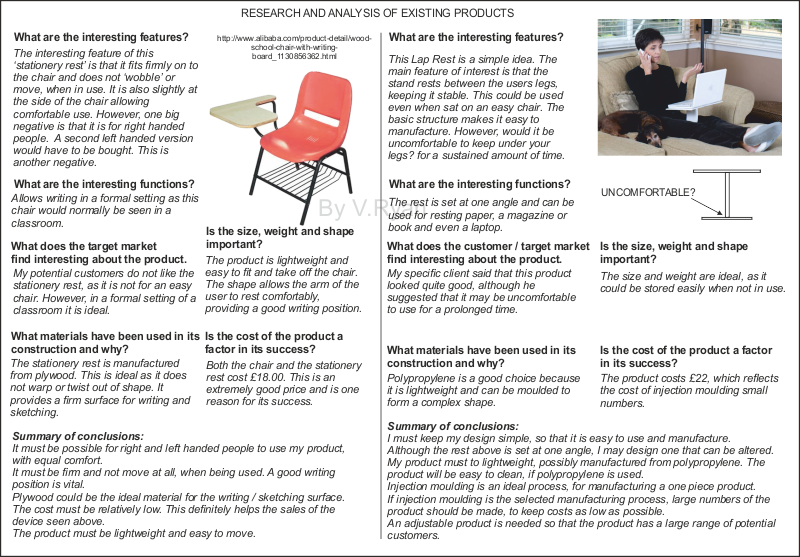 Carefully analysing your research findings, could help you design a successful, innovative product. If you identify an interesting function or feature, the next stage is to determine why the function / feature has been included. Photograph the existing product, paste it on a design sheet and write key questions around it or alongside it. Working out the questions to ask is sometimes difficult. However, a selection of useful questions are set out below. They may not suit every product. Consequently, think carefully about the questions you need to ask. 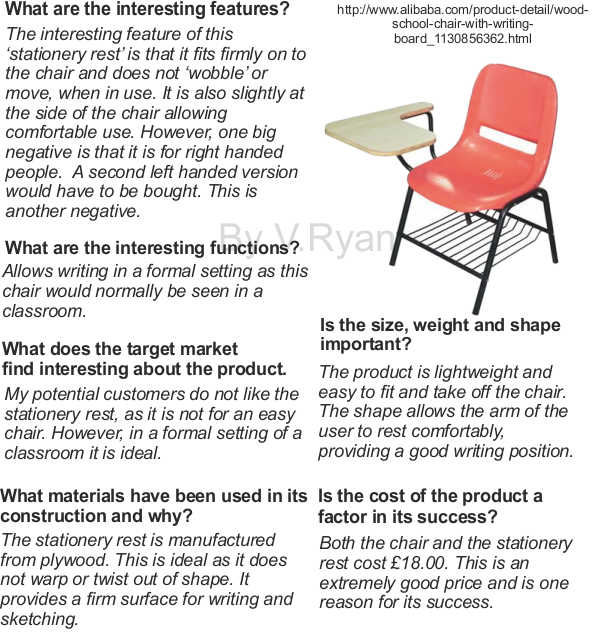 Answers to the questions, should provide information that will help you in the design work that follows. What are the interesting functions? What are the interesting features? What does the customer / target market find interesting about the product? What materials have been used in its construction and why? (Look at the properties of the materials). Is the cost of the product a factor in its success? Is the size, weight and shape important? Is the product environmentally friendly. Is it a sustainable product? What is innovative or imaginative about the product? 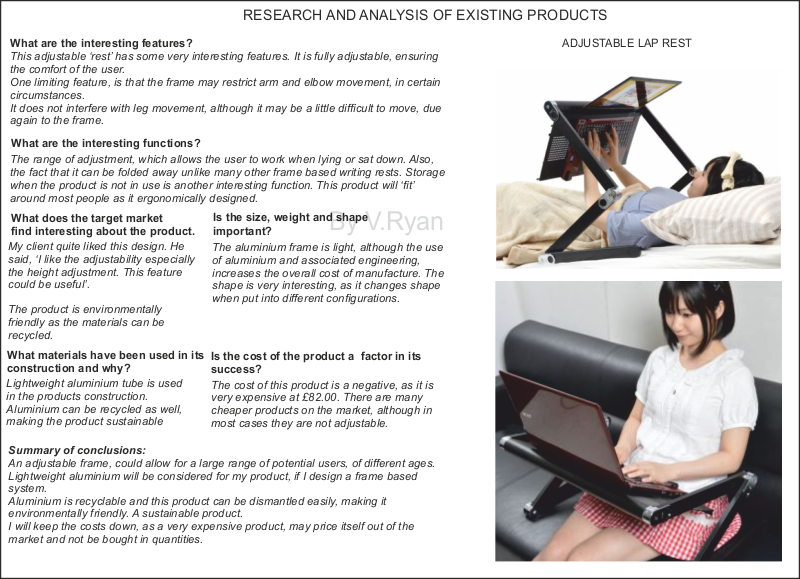 The research below is foccused on existing 'writing rests' The designer has been commisioned to design a new writing rest for an easy chair. Therefore, research focusses on existing rests, in an attempt to identify useful features and functions. It is important to summarise your findings. A summary of conclusions is basically a paragraph. Include what you have learnt from the existing product, that will help you design your product. Do not include negative points unless you feel it is necessary.